With all the reveals, minor and not, from the first two days of San Diego Comic Con, a Titan Master Daniel / Leinad was also shown on the Trypticon Crunch list of potential characters - and hey presto! 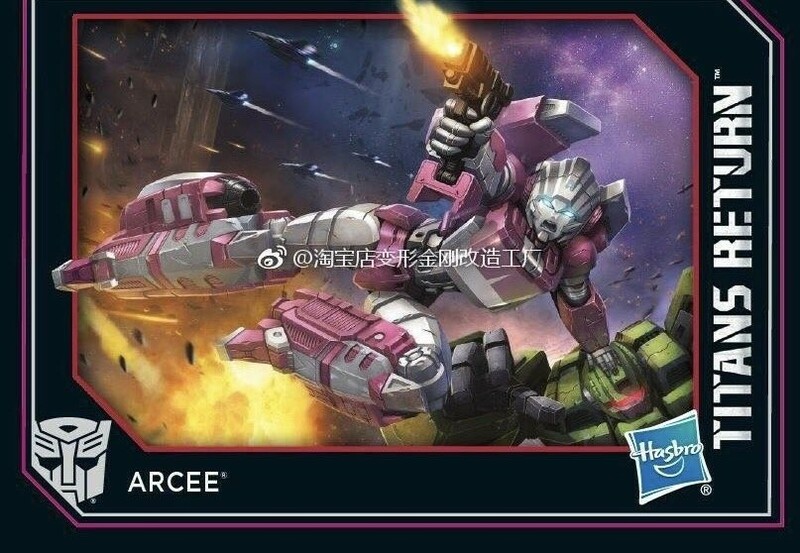 not long after, regular weibo leaker 淘宝店变形金刚改造工厂 has a card for Titans Return Arcee! Check it out below, and let us know what you think of this rumoured new homage to Headmaster Arcee of old, in the Energon Pub. That Arcee card does look neat, but there's a problem. The art is inconsistent with EVERY deluxe collector card so far. Each one before has had the character in a neutral standing pose with their heads floating slightly above their neck-sockets. 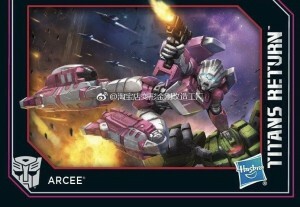 If that is at all accurate to what Arcee is going to look like, it seems she's a Blurr retool. Sigma Magnus wrote: That Arcee card does look neat, but there's a problem. The art is inconsistent with EVERY deluxe collector card so far. Each one before has had the character in a neutral standing pose with their heads floating slightly above their neck-sockets. That is weird, even Slugslinger is the same way. Since Slugslinger was developed alongside Misfire, they may have changed the art style a little early towards what it will be for PotP, just after finishing Slugslinger, but before Arcee and whatever else is coming. See Va'al, this is what I was talking about. Why not mention this stuff at SDCC also instead of having it be revealed this way instead? Hascon will be too late just like they were far too late at Toyfair with this line's reveals. Assuming of course that this is real and that new toys are coming out Q4 in the generations line. There is no joy under late capitalism. 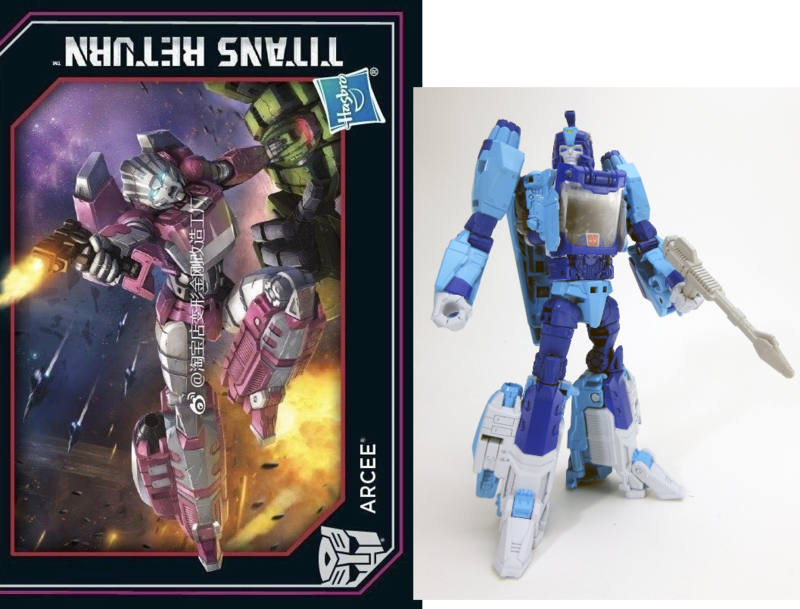 I just noticed something else weird about the Arcee card. Her whole bot mode is Blurr, except for the typical Arcee backpack. Either the artist goofed, or we could be getting another slight remold to make the front of the car look more Arcee-ish. Now onto the rampant speculation. I think the leak of the card, plus the Tryppy Crunch list means that the unaccounted for titan masters are for wave 6 instead of the names for the TM's from the 2 boxed sets. I also think we are going to get some form of another 2 boxed sets for the Scorponok and Ultra Magnus heads. That leaves 7 new TM unaccounted for, with 6 autobots and 1 decepticon. However, Blunderbus and Overboard were each in the wrong faction on the list (soo Hasbro) so there is a chance that one of the new ones is also wrong. Backwards Daniel would obviously go with Arcee. For the other 6, none of the names really stand out as matching up with any of the Autobot target masters or the decepticon voyager triplechangers, so I'm fairly stumped, and then you throw Ginrai in there, who knows what the hell that could mean. The one that seems sort of obvious to be would be Prof Go and Go Shuta, possibly as another Chromedone redco? Fathom is likely being related to some type of boat or marine vehicle, so I'm guessing Flattop here out of Broadside. See, damn, now I'm really confused, because at least 1/2 of the names you've matched up fit really well. But then, if they have the diecast heads for the next 2 boxed sets already determined, what about the rest of the bots for those sets? Is this a shift from TR to PotP, where only the little diecast heads will be TM's? and if that is the case, then we are looking at a Wave 6 with only Slugslinger, Arcee and whatever Refractor goes with? for a wave that will be out for Christmas? Not feeling this Blurrcee going by the art. If it was her own unique mold and Blurr had never been made, fine. But if I was to have her stood next to Hot Rod, Blurr, Kup and others, it's just too darn obvious that her and Blurr are the same whereas the Generations toy is Arcee through and through. I'm happy to get another Classic Style Arcee, even if she's a minimal retool of Blurr, but I have to wonder what we would have gotten if she'd won the vote for the next Prime. I also find it odd that her headmaster might be "Daniel" when they didn't use "Spike" for Fortress Maximus. But then this means that the other 2 boxsets dont have names for their titan msters. So it doesnt really hold up either one way or another. Parsec's power fits with Nautica's speed motif. Dynamus's power fits with Quickswitch's many modes. Fengul's name is an anagram of "engulf", and his power is "Optics Scorch", "Optics" sounds like "Optimus" and the scorch part ties in with the imagery of Optimus burning down a forest on Laser Prime's tanker trailer. Scorponok and Ultra Magnus both have "Ultimate X Boost" powers like Rodimus Prime and Thunderwing, so they were likely going to be in the two remaining sets that won't see release this year. Refractor for Reflector's just a guess, though. But "invisibility" would be a decent power for a camera-related guy. william-james88 wrote: But then this means that the other 2 boxsets dont have names for their titan msters. So it doesnt really hold up either one way or another. The two other sets aren't coming as they originally were planned to anymore. We're only getting the first two this year, and the change of plans is what led to Cloudraker and Wingspan getting put in a Walgreens two-pack. If we get the remaining two sets next year, they more than likely won't be in the same form that they were originally going to be. Was this confirmed? I have been struggling to follow the box sets news with opinion assumptions and facts all blending together in message boards. Cool thanks! Although they didn't directly state that the other sets will be released next year.